I noticed this problem while working on my original project so i created a simple scene to test it. The scene contains a PlaneMesh with an OmniLight above it. When I run my scene or export it as an exe to test it on windows, it works... the light "shines" on the mesh., but when I export it as an apk and install it on Android, the OmniLight does not "shine"... i have also tested this with the spotlight and it also does not work. The Directional light does seem to work. Now for the strange part. In my original project when my character(something i created in blender) moves under the lights, it dose shine on it... but on nothing else. So i thought it might be because the ground mesh was not created in blender, so i did that and uv unwrapped, added all the textures, but it did not make a difference. using bakelightmaps also does not work. Is there something i need to set in the editor setting to fix this or is it just broken for Android? Vertex Lighting seems to have caused the problem, when I disabled it in the Editor setting, the lights worked as expected on Android. I know not using vertex lighting may cause performance issues, but this works for my case. 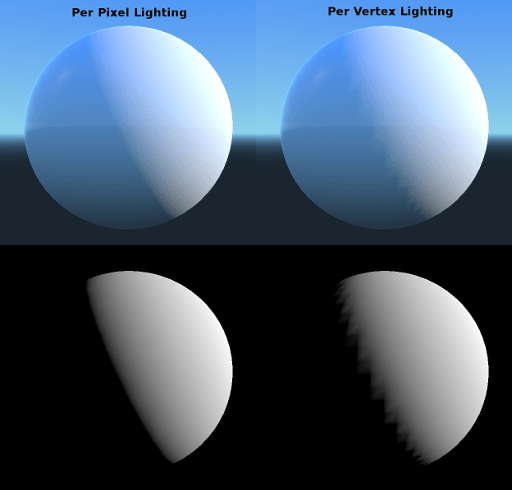 Just to let you know, that parameter pretty much forces all materials to do their lighting calculations for every vertex instead of every pixel. This should improve performance, but at the cost of less accurate lighting.